The common cold may have bested you before, but not anymore. While the cold and the flu have no absolute cure, there are ways you can keep them at bay. A solid routine can keep you functioning to meet your deadlines and put you back on your feet in no time. It is essential to drink plenty of water on a regular day, but it is all the more important when you are sick. Your cold could be a bacterial or viral infection, and water can help flush out what is in your system. If you suffer from a clogged nose, warm water can help relieve the congestion. If your mucus is runny, the warm water can help wash the nasal drip and prevent it from irritating your throat. Always keep a thermos or bottle of water beside you when treating your cold. 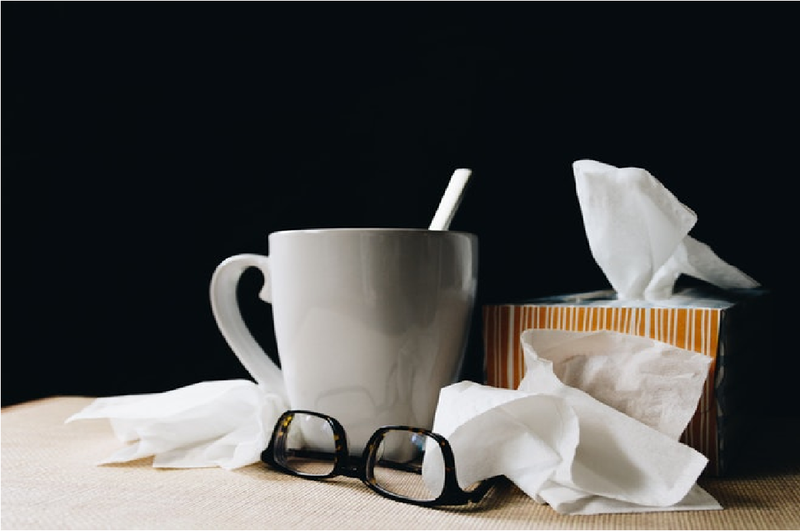 Your immune system is compromised when you have a cold. Besides drinking water, you should also nourish your body with vitamins and minerals. An easy way to do this is by drinking tea. Now, not all teas are created equal when going against a cold. Each dried leaf, bark, or spice is a speciality. You can take a ginger root, thinly sliced and steep it in hot water with honey as a sweetener. Studies on ginger show that its rhizomes have anti-allergy properties. Another root you can use is turmeric, which is closely related to ginger. Like ginger, using turmeric for colds can be useful because it is an antioxidant and has anti-inflammatory properties. When you have a cold, your sinuses are inflamed, and it closes your nasal passages. Your nose creates mucus to flush out the irritants that triggered your nose. Ginger and turmeric can be used to calm that area. Your sore throat and cough can come from the bacteria in your nasal drip. You can gargle an antiseptic solution from your local pharmacy. For home remedies, you can rinse using warm water with salt to ensure that the mucus does not linger. Adding honey to your tea and water can also help because it has antibacterial properties. If you feel like these steps are not working for you, try mincing one clove of raw garlic and eating it. Garlic produces allicin, an antioxidant that has been used to treat coughs and fevers (among other things) for years. Warning, it has a very sharp flavour, so honey and water after eating it can help deal with the aftertaste. Even when you have to work through your cold, you need to give yourself time and space to bounce back. Stress and fatigue will not help your case. Try to sleep a minimum of six hours, which is the average amount for an adult. If you cannot commit to six hours, compromise by taking naps throughout the day. If you do not rest properly, you could unnecessarily prolong the cold. Colds do not have to be impossible. As soon as you feel a tickle in your throat or nose, immediately take steps to treat it as if it were a full-blown cold, to stop it in its tracks. Previous articleLiving with Stiff Neck?